Batgirl made her first comic book appearance back in 1961 and has been the alter ego of several Female characters within the Batman universe. Like Batman she began fighting crime as a vigilante and has often been portrayed as the sidekick to Batwoman. Since her first appearance she has become a firm favourite for Female comic book fans which in turn has made her a very popular choice for Ladies fancy dress costumes. You too can experience the high's of dressing as Batgirl by wearing our fantastic Bat Girl plus size fancy dress costumes, the epitome of super hero chic thanks to the flattering and very feminine outfit. 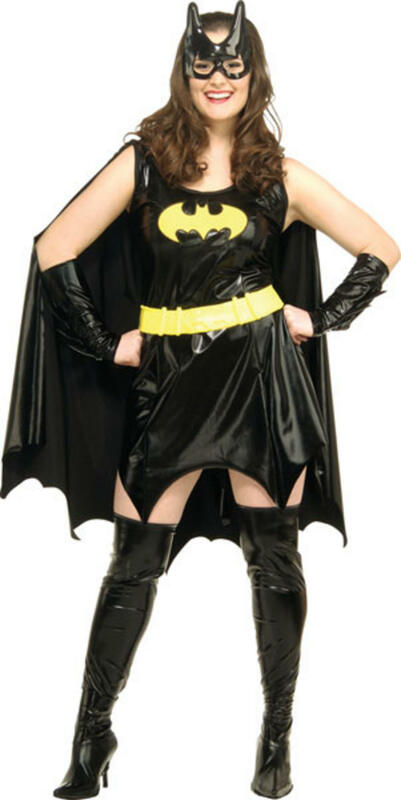 This Batgirl fancy dress costume includes everything perfect for fighting crime in Gotham city and consists of a black PVC look dress with attached flowing cape and of course embroidered bat logo to the chest. The costume includes all the Batgirl accessories for completing the look: Matching PVC look glovelets, the all important Batgirl utility belt, boot toppers and of Batgirl eye mask. Before you know it you'll be fighting crime in style.